With so much crude oil being shipped overseas from U.S. ports, it has some crude experts wondering if it could soon affect the price of U.S. oil. Brent crude in London went over the $60 mark this week while West Texas Intermediate oil hit $54. All the while, crude exports hit a record 2 million barrels a day just two years after the decades-old ban was lifted. 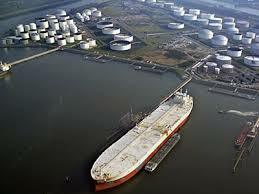 Some of the analysts suggest problems could develop if exports reach 3.5 million to 4 million barrels a day. Just how much the ports along Texas and Louisiana and elsewhere can handle is anybody’s guess. That’s because the U.S. Energy Department does not track the capacity and terminal operators and companies do not disclose their capacities. But U.S. crude production is at 9.5 million barrels a day and there could be another 1 million a day soon, putting pressure on the ports where the oil is headed overseas. Just last week, Oklahoma City-based Continental Resources announced the sale of 1 million barrels of Bakken crude that will eventually be sent to China. “Right now, there seems to be a little more wiggle room for export levels,” said Michael Cohen, head of energy markets research at Barclays in an interview with Reuters.